Patrickswell Brownes: But really, where in County Limerick? After I eliminated the three Timothy Brown(e)s found in Griffith’s Valuation, I actually gave up looking for the family, at least for awhile. But, I decided I would review all of the House and Tenure Books for Timothy in the area of Patrickswell After all, we do know the family did not leave until after May 1847, and, the valuation for Patrickswell was being done at that specific time frame. I won’t burden you with all the details, but, it took a long, long time to find him. I will tell you that I started in the vicinity of Ballybrown in the northern part of the church parish. The name of the parish is Patrickswell and Ballybrown Catholic parish. Now, you would think that with a name like Browne, logically, the family would be in the Ballybrown area, right? Wrong! 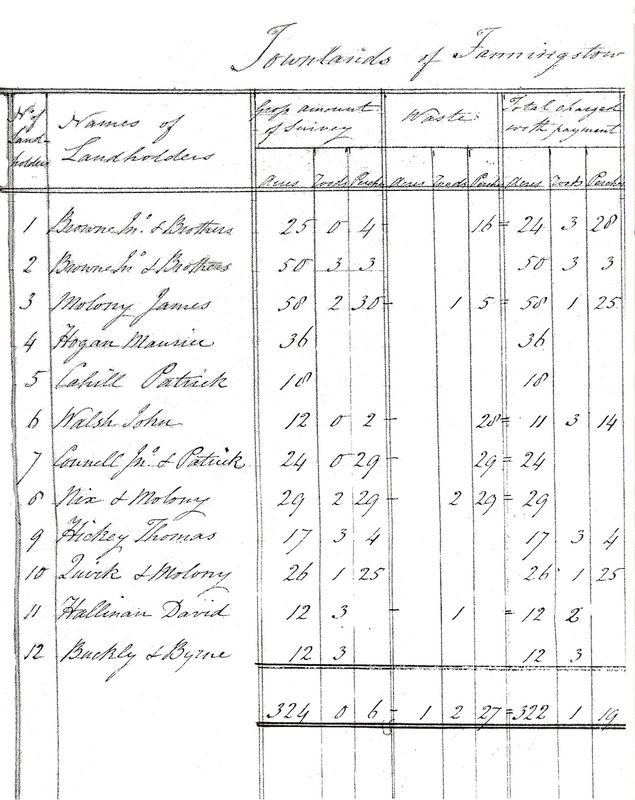 There were no Brownes in Ballybrown, nor were there Kellys or any of the other names shown in the church record. Who would have thought? When I finally got over that fixation, I decided to try the area around Castleroberts where Timothy #2 was located. I’m not sure why I picked that area, but, I think there was a guiding hand somewhere. Fanningstown, next to Castleroberts, but notably within Patrickswell parish was one of the areas I checked. The first entry in the Fanningstown Tenure Book is John and James Browne. The original image covers two facing pages.1 The image at the left shows both the left (top portion) and right (bottom) sides of the document. 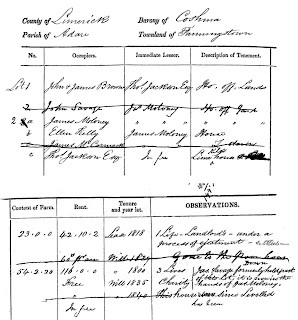 The left side shows the Occupiers name, who the land was leased from and whether there is a house, farm buildings, etc. The right side of the document shows the amount of acreage, rent due, the date of the lease and any notes made by the valuator. 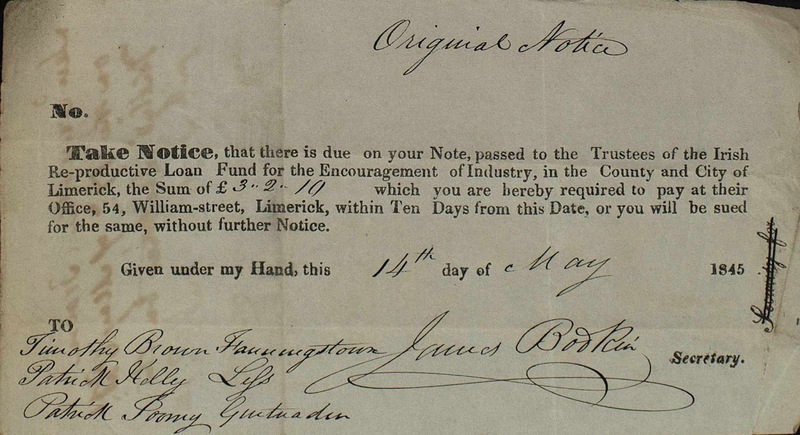 The lease for John and James Browne started in 1818 and runs for the duration of the landlord’s life. There evidently was some problem because they were in the process of being ejected from the tenement. It was settled and these men ARE shown in the published version of Griffith’s which means they were in residence in 1851. The second entry shows James Moloney and Ellen Kelly. Ellen is a charity case living in a cottage that is “rented” from James Moloney. There is a good possibility that Ellen is a relative of James Moloney. They, too, are in the published Griffith’s. There were two lines, at the top, showing “Browne Jno & Brothers.” Line 4 shows Maurice Hogan and line 11 shows David Hallinan. Maurice and David were witnesses at the marriage of Timothy Browne and Hannah Kelly! I looked at the Fanningstown Tenure Book again and found entries for Thomas and Thady Browne. 3 (See image for Thomas and Thady Browne below left. Image has been cropped to show only these two men.) 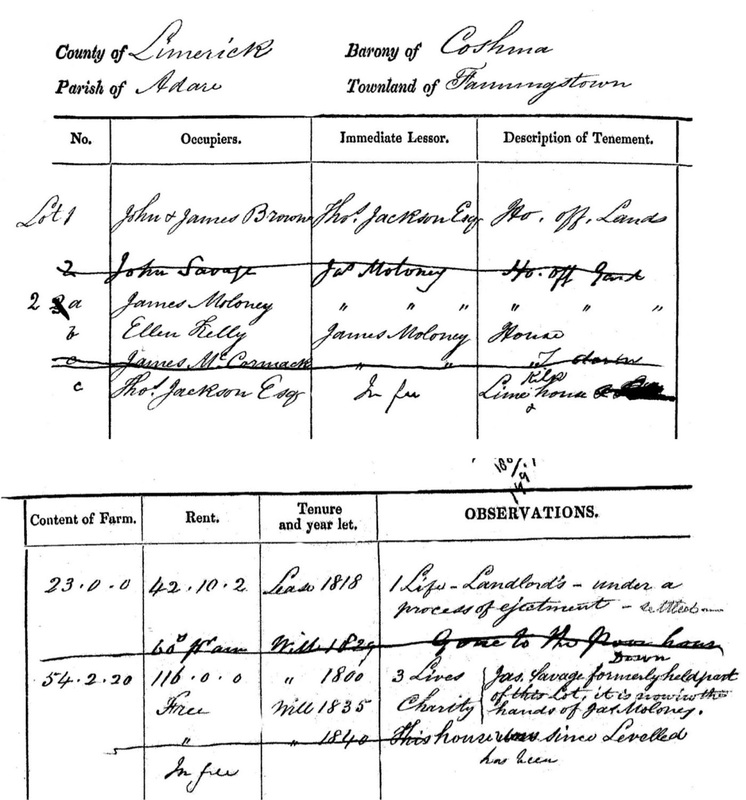 Like the image for John and James, the left portion of the document is shown in the top portion; the right side of the document is at the bottom. While they are shown together, each of them holds about 27 acres of land. John and James above have 23 acres. Looking back at the Tithe record for John Browne and Brothers, they hold a total of 75 acres. Combining the three entries in the Tenure Book, there is a total of approximately 75 acres. This is probably the same family, but where is Timothy? I initially decided this was a different family and went on to other townlands with no luck. That is until I took an Irish Genealogy course in 2011 which included a lecture on names and naming patterns. It seems that Thady (pronounced Tā . dy) is a substitute name for Timothy! The Irish have a LOT of alternative names and nicknames.4 The letter from the Limerick Archives (see previous post dated January 3, 2016) gave an alternative name for Hannah; it did not mention any alternative for Timothy. The actual church registers, not available to me until 2012, (shown in the same January 3, 2016 post) show Thady/Thaddeus in some of the records. I only wish I had known about this earlier! Now the Tenure Book entry for Thady and Thomas Browne makes sense. 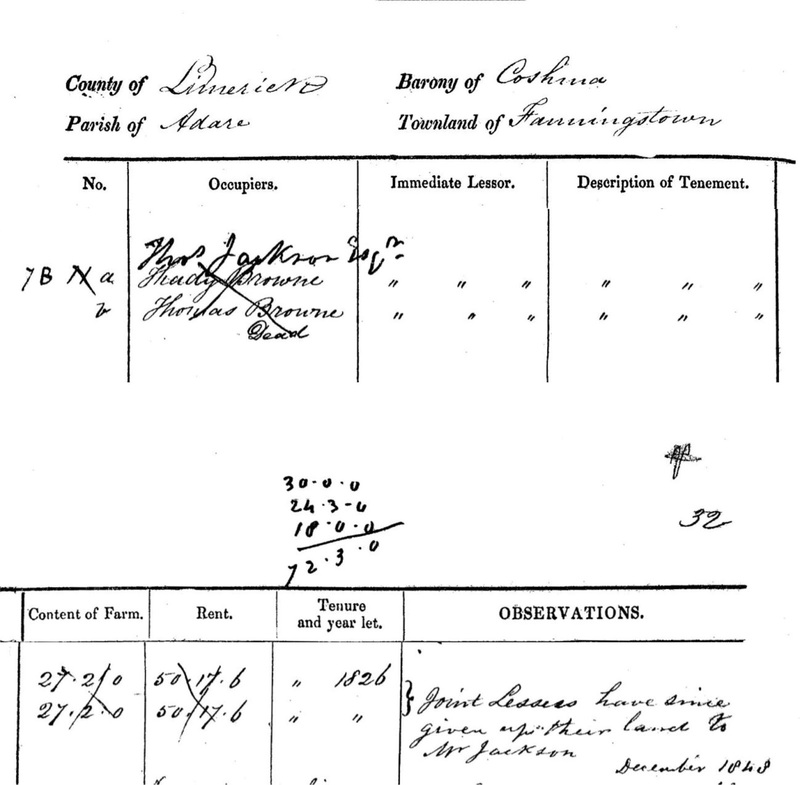 They are part of the “John Browne & Brothers” from the 1821 Tithe Record. There are two other vital pieces of information in the Tenure Book. First, notice that both Thady and Thomas Browne are crossed off with the notation “Dead.” Does this mean one or both of them were dead? 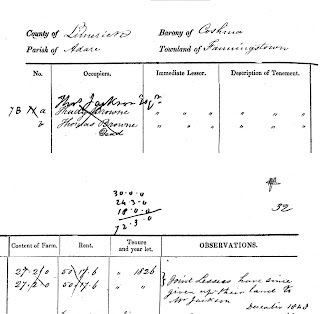 Because of the notations in the Observations column, I believe both had died. The tenure for these men began in 1826 as a “joint lease” but had been given up to the land owner, Mr. Jackson, in December 1848. 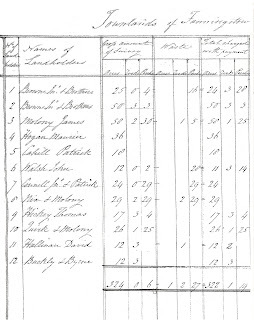 Remember that prior to 2011, I had located a passenger list that gave the date of the family’s arrival in Boston in January 1849. Taking into consideration the average length of time for the voyage, December 1848 would be a logical date for the family to have left Ireland. There is another piece of information that provides further proof that Timothy and Thady are the same person. Early in 2015, Find My Past made a new record set available. This is the Poverty Relief Loan List (Reproductive Loan Fund). 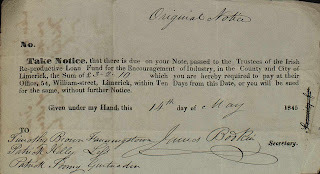 A loan is registered for “Timothy” in Fanningstown.5 (See image at right.) The document gives the names of the persons who signed as surety for Timothy. One of them is Patrick Kelly of “Lys,” (contraction of Liskilly, the townland bordering Fanningstown on the north), who is the likely sponsor at the baptism of Mary Browne in 1837. There is other information available for Fanningstown, but, that will need to wait for the next post . in other occupations, such as a cooper, or miller for example. 4. While there are many sources available to identify Irish naming alternatives, two of the best are: A Rose by any Other Name: a Guide to Irish Christian Names by Judith Eccles Wight available online at https://dcms.lds.org/delivery/DeliveryManagerServlet?dps_pid=IE105460; and First Names in the Help section of RootsIreland.ie at http://www.rootsireland.ie/help/first-names/. Roots Ireland is a pay site, but the Help section is free. Each site has names not shown in the other. The composite list of names for Timothy is: Tim, Timy, Timmy, Timothius, Timotheus, Timothi, Timothio, Thaddeus, Thady, Theady, Tady, Teigue, Teagye, Tomaltagh, Tumelty, Tiomóid, and Tomaltach. Alternate names for Honoria are: Hanora, Honorah, Hanara, Hanorah, Hanna, Hannah, Hon, Ann, Anna, Honny, Honor, Noey, Nonie, Nora, Norah, Norrie, Norry, Onny, Johanna, Joh, Johannah, Joanna, Johan, Joan, Jane, Siobhán, Nancy, Nóra, and Onóra, It’s no wonder they were so hard to find! Fascinating as usual. Thank you for sharing.I am certainly benefiting from your hours and years of hard work. Mary Ann, I finally made it here. Great blog. I especially love the picture of the house. I'll have to read the whole thing when I get a little time. Thanks Kathy. This was all due to your inspiration!